4.9% average reduction in greenhouse gas emissions per hectare across 15 farms in receipt of Glastir Efficiency Grants for which detailed repeat "carbon footprints" have been assessed using the Bangor carbon footprinting tool. 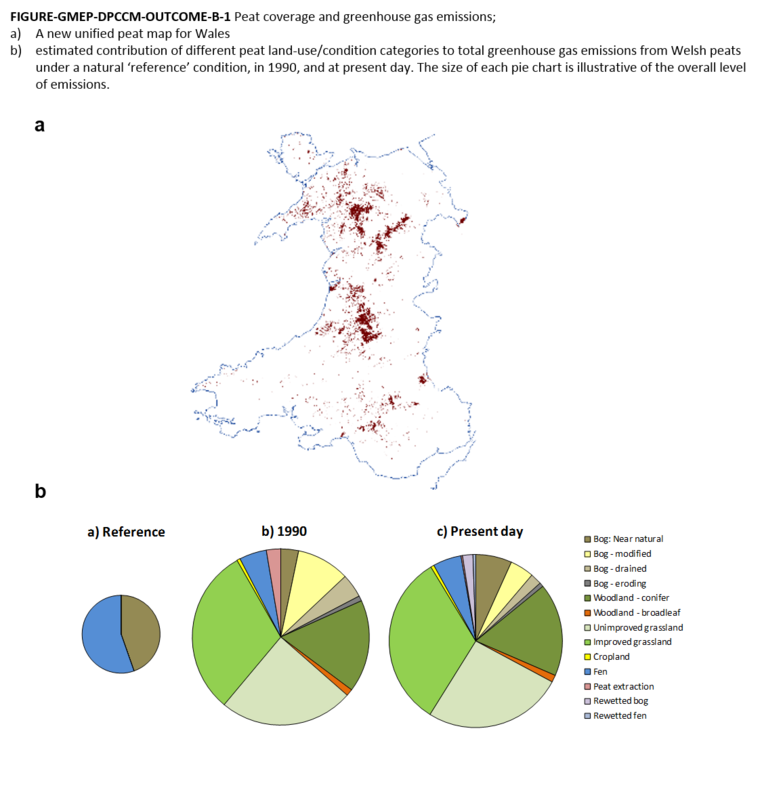 Modelling using the Farmscoper model suggest the impacts of Glastir agreements for methane and nitrous oxide emissions will result in reductions of 1.4% and 1.8% respectively for Glastir farms which scales to 0.6% and 0.8% for Wales as a whole. 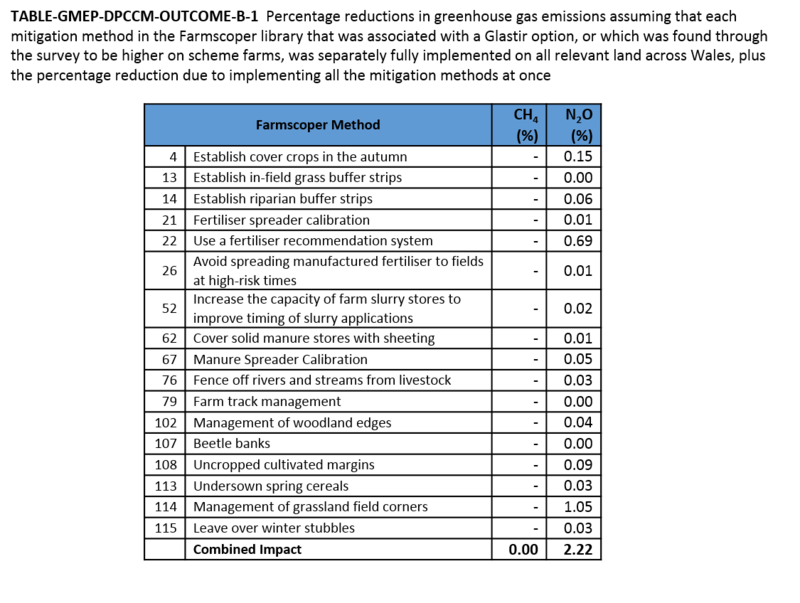 In Year 1 of GMEP, modelled estimates based on more ambitious estimates of potential land use change and reductions in animal numbers and fertiliser use for greenhouse gas emissions were 8-10%. An increase of just 2.5 tonnes per year (0.1%) extra sequestration of carbon in vegetation and the top 1m of soils has been calculated using the LUCI model as a result of all woodland actions undertaken within Glastir reflecting the rather limited uptake of Glastir woodland grants. 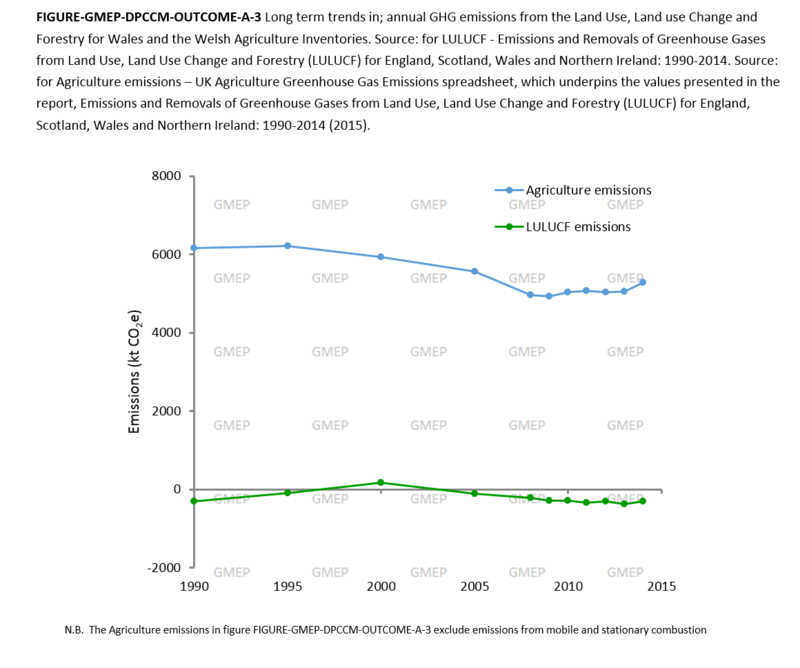 There has been a recent increase in greenhouse gas emissions from both the Agriculture Inventory and the Land Use, Landuse Change and Forestry (LULUCF) Greenhouse Gas inventory. 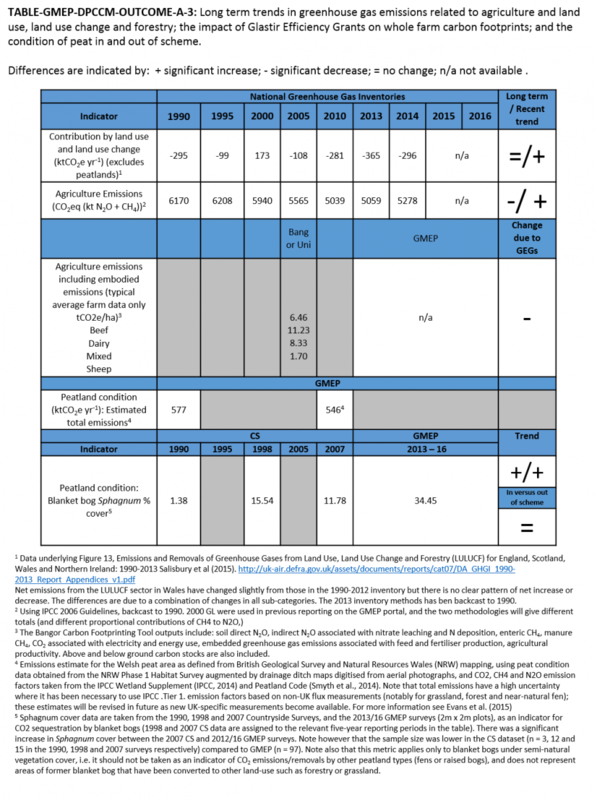 The 14% reduction in agricultural emissions between 1990 and 2014 due to a 42% decline in fertiliser use has been reversed to a 4% increase between 2013-2014 due to increased nitrogen fertiliser use, and increased dairy cattle and sheep numbers. The decrease in the greenhouse gas sink of woodlands is due to ageing of the current resource and limited new planting. Based on a new 'unified' Welsh peat map developed within GMEP, peat soils are estimated to cover more than 90,000 ha of Wales (4.3% of the total land area) of which 75% is in upland areas, and 25% in lowland areas. Overall, around three quarters of the Welsh peat soil area is thought to have been impacted by one or more land-use activities, including drainage, overgrazing, conversion to grassland and afforestation. Of this area only 30% is in 'good condition' with 25% 'modified' into grassland and 10% into woodland. As a result of these activities, Welsh peat soils are currently estimated to be generating 'anthropogenic' emissions of around 400 kt CO2-equivalents per year (equating to approximately 7% of all Welsh transport-related emissions). This compares to an estimated natural 'reference' condition (i.e. if all the currently mapped peat area was natural bog or fen) of approximately 140 kt CO2-equivalents per year.